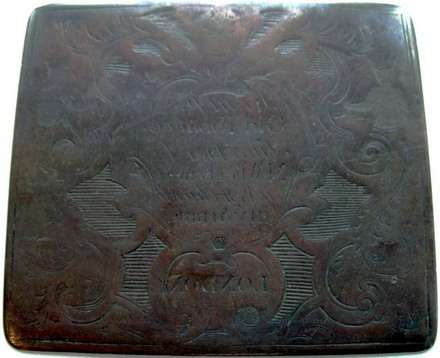 Copper printing plate for Kemp’s Old Tobacco Successor to M. Wheatly near [?] New Church IIIV Strand, London, 1700s. Gift of Allen Scheuch II, Class of 1976. Graphic Arts Collection 2012- in process. 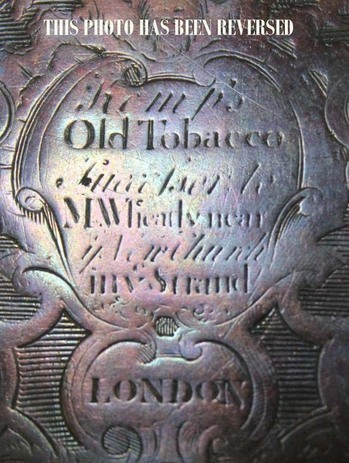 London directories for the 1780s and 1790s all list two tobacco merchants named Kemp: Kemp & Bourguigon, 28, King-Street, Tower-hill; and Anthony Kemp, Tobacconist & Brandy Merchant, 87, Aldgate. We have not been able to find one on the Strand or named Wheatley.